ASD (Autism Spectrum Disorders) impair a child's ability to communicate and interact with other people. ASDs are also characterized by ritualistic or repetitive behaviour, such as finger tapping or head banging, or constant picking. Constipation is also more common among kids with autism, and it seems that kids with ASDs frequently experience abdominal pain, stool leakage, bloating, and reflux. 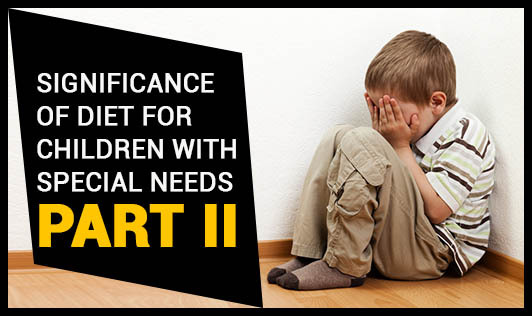 To eliminate the problems described above, special care should be taken to consider food intolerances of such children. Foods most likely to cause allergies or other reactions include milk, soy, eggs, wheat, and corn. When a child is allergic or sensitive to a specific food or ingredient, it should be eliminated from the diet. One suggestion would be to eliminate one food at a time, from the diet, so you will know which food is causing the hitch. If it is milk, you may need to experiment a bit to find a substitute for the milk your child loves. Many kids adapt to the gluten-free, casein-free (GFCF) almond, potato, coconut, or rice milk substitutes available. Look for varieties that are enriched with calcium and Vitamin D. Many parents provide vitamin and calcium supplements to their children while they are on the diet. 1. Enjoy a balanced diet that is composed of complex carbohydrates from sources such as whole-wheat foods instead of refined products like maida & processed foods; proteins from meats and beans, roughage from cereals, fruits and vegetables, and fats from butter and oil (restricted to avoid weight gain and increase energy levels). 2. Constipation may be treated through dietary changes. Fibre-rich foods like fruits, vegetables, flaxseeds, or with enemas or suppositories when necessary. 3. Supplementation with both single vitamins and vitamin mixtures. Include 3 to 5 servings of fruits & vegetables in the diet. 4. Include foods rich in zinc such as whole grain products, beans, peanuts, potato, low fat yoghurt, lean meat, and dairy products. Pumpkin seeds are also a good source of Zinc. 5. Include foods rich in selenium like cereals (e.g. corn, wheat, oats and rice), walnuts, legumes (soybeans), animal products (beef, chicken, egg, cheese), and seafood (tuna). The child's eating habit has to be monitored. It is also helpful to ask friends who may be unaware of the dietary changes; if they see improvements in the child after a few weeks of implementing the changes. When you have a child with special needs, nutrition probably deserves your participation as it specifically may play a central role in your child's future growth.